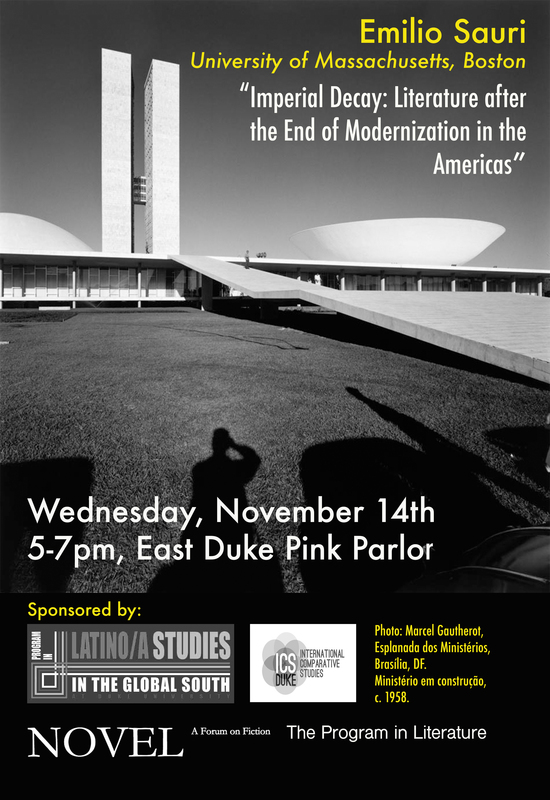 On Wednesday, November 14, Emilio Sauri will give a talk titled, "Imperial Decay: Literature after the End of Modernization in the Americas." The event will take place from 5-7 p.m. at the East Duke Pink Parlor. Sauri is Associate Professor of English at the University of Massachusetts, Boston. His research focuses on literature and visual art from Latin America and the United States and reads these in relation to the development of the global economy from the end of the nineteenth century to the beginning of the twenty-first. He has coedited two collections, Literature and the Global Contemporary (2017) and Literary Materialisms (2013), as well as a special issue of the journal nonsite on Latin American literature and theory. He currently serves on the editorial board of the journal FORMA (https://www.formajournal.org/), and his book Imperial Decay: Literature and the End of Modernization in the Americas is forthcoming from Northwestern University Press.